News4 Today's Eun Yang read to Ms. Barber's class at Greenbelt Elementary School. 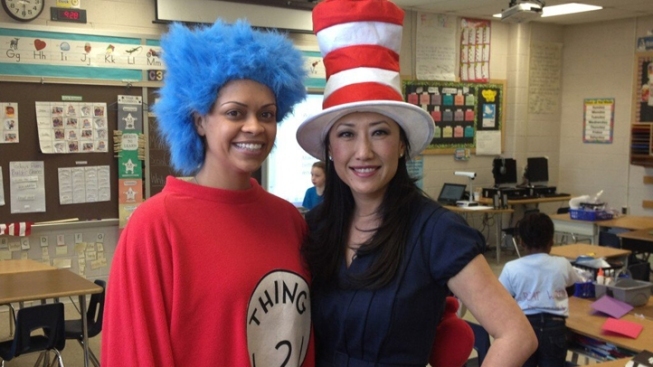 Wearing red-and-white striped Cat in the Hat hats, News4 Today anchors and reporters joined Prince George's County schools to read to students on Read Across America day Friday. Seven members of the News4 Today team fanned out across seven elementary schools in the county to read to students. "The kindergarteners at Laurel Elementary love to talk and ask questions," said News4's Richard Jordan. "The only time they all sat quietly was while we read 'The Cat in the Hat' - proving Dr. Seuss can still captivate a young audience." News4's Tony Tull and photographer Irene Johnson showed the first-graders at Springhill Lakes Elementary School a News4 live truck - and the students even got to see themselves on camera. "Reading to the kids reminds me of how important it is to be ingrained in our community," Tull said. And as for the reading of "Green Eggs and Ham"? "They loved it," Tull said. This was the 16th year that the National Education Association held Read Across America, an event held annually on Dr. Seuss’ birthday. More than 45 million people were scheduled to participate, the NEA said.